Q:What material of pipe are you specialized in? 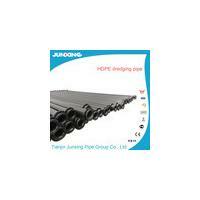 Q: Do you produce PVC pipes and fittings? A: Sorry, dear friend. We are more professional PE and PPR pipe and fittings, which are more suitable for drinking water as they are more hygienic than PVC material. Q: Please tell me your largest outer diameter for pipes. A: We can produce 1600mm diameter (dredged pipe) as the largest size. Q: For pipe fittings, what do you do mainly? Q:Where is your factory located in?